Palm View Sunrise is a tranquil secure and well equipped 4 bedroom, self catering, holiday house that sleeps 6 - 12. The house boasts lovely ocean views off both decks, one of which leads off the main bedroom with on suit bathroom. The venue is in walking distance to the beach with amazing tidal pools, perfect for young children and is very close to high rock restaurant that also has its own swimming pool. This holiday house is located in the peaceful village of Palm Beach and it is just a short drive to the banks, shops, restaurants and pubs in Margate and Port Edward. 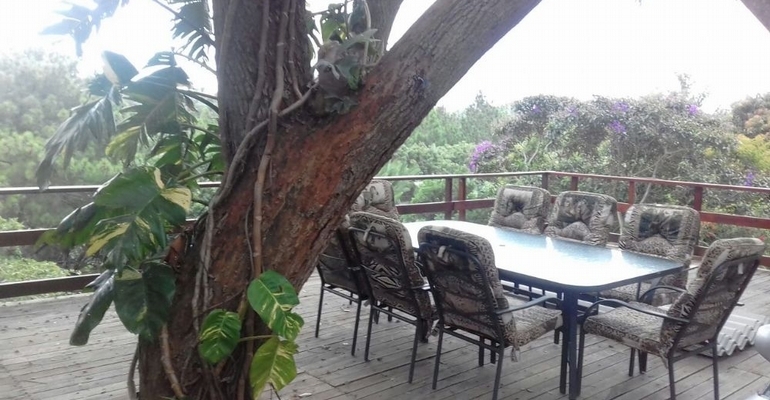 The house is just 1 km from the popular McBanana tourist attraction, and a short drive to the Wild Coast Sun with its casino, water park and golf course. All Holding Deposits are non-refundable. Breakage deposits will be refunded within 7 working days if all is in order.